Starting point again at Vratnik notch just below the deserted hotel. Follow the gravel road and after about 3km you will reach nice private house with a beautifull overview of the area. Stop there and enjoy! The rest of the path leads through nice small villages mostly with just a few houses. The area here is beautiful. The path itself is not difficult and there is not much uphill. 14km after the start you reach village Oltari where we make break for the boring uphill to Zavizan. In order to make it a bit more interesting we decided to try a new route following a hiking trail. The start was promising following a gravel road to village Babic Dolac. Just before entering the village there is a really nice overview of the nearby islands. 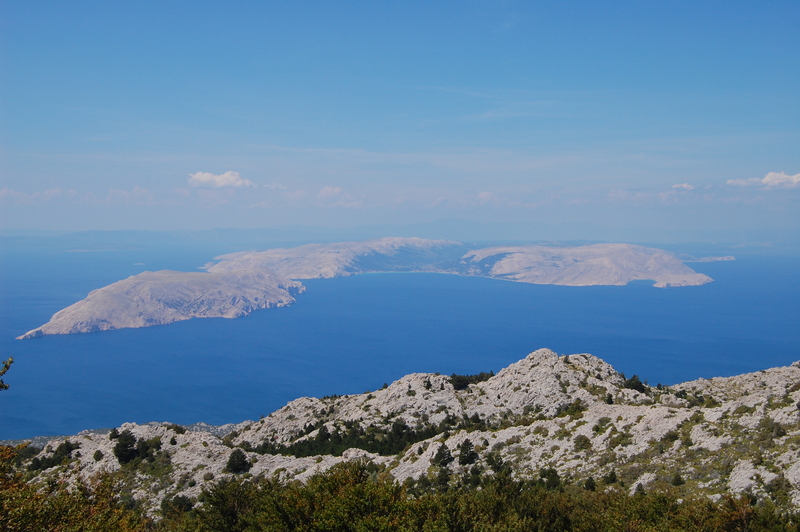 The view reached islands Cres, Losinj, Premuda and Dugi Otok. In the village we followed the marked trail and soon we had to push the bikes. As this part of the track is not well covered by neither of the maps we had (I don’t think there is even such a map) this lasted for 1.5km and made us pretty exhausting. Finally we reached some gravel road, followed it in the wrong direction, had to go back and finally connected to the road from Oltari to Zavizan, the same one we wanted to avoid! Soon we reached the Park entrance. Following the gravel road after 8km we reached Zavizan. Plan was to eat there and carry on towards alpine hut Alan but we were so exhausted and abandoned the idea. We had a nice dinner and just before 22:00 went to sleep. End of day 1, total distance 40 km. Day 2 started with a nice breakfast at the hut. Just after 8:30 we left and just as the last year we followed the gravel road to Careva kuca, some 15km from here. Now on the road heading towards Stirovaca (local name Štirovača) we passed alpine hut Mrkvište. Here is the intersection with the road leading to hut Alan and further to Jablanac (ferry to island Rab) so you can make a shorter route starting from here. Reaching Stirovaca and cooled down a bit on the well we carried on following the gravel road to hut Kugina kuca (translated to eng. “Plagues house”) some 12 km away. Here is a difference between last years track and this one. On the intersection just after the hut we went straight towards Dabarski kukovi (one of the places for freeclimbers). This is really a nice gravel road with a beautiful area. Reaching the top near Dabarski kukovi we also reached the final uphill. From here on it was just downhill but unfortunatelly only road. In 16km we reached Karlobag but our final point was Ribarica, a village 5 km north of Karlobag. One hour later we were on a party having a goat with a live music from Pickziebner band! End of day 2, total distance 75 km.